See the EDP write up on Surprise Surprise TV Programme. 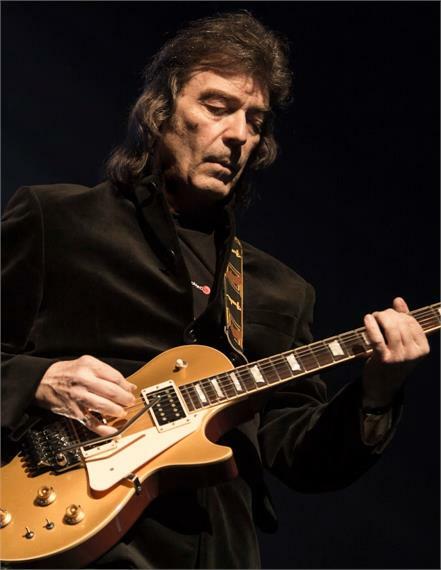 JUST CONFIRMED THAT "STEVE HACKETT " IS NOW OUR PATRON ------------NORTH WALSHAM LIVE AID ALSO INCORPORATES "WISH UPON A STAR"
IF YOU WOULD LIKE TO DONATE TO THIS YEARS CHILDREN'S CHARITY PLEASE USE THE DONATE BUTTON AT THE BOTTOM OF THE PAGE, THANK YOU! 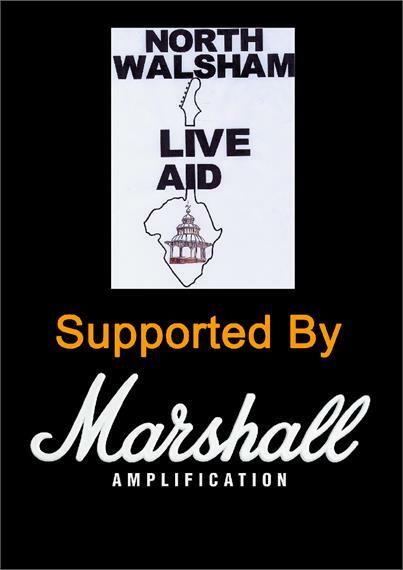 North Walsham Live Aid was formed in 1985 following the massive success of the Wembley event. It was organised by Barry Holden, Gerald Turner, Rod Palmer and Darren Turner and was supported by The 3rd World Centre in Norwich. The aim was to purchase two Bedford trucks, fill them with aid and send them to Eritrea where the famine was worst. To raise the £8,000 needed a rock concert was organised at the community centre in North Walsham with 10 bands playing for free and a memorabilia auction with items donated by many stars. The concert was a huge success and was followed by a further outdoor concert raising in total over the two events around £10,000. 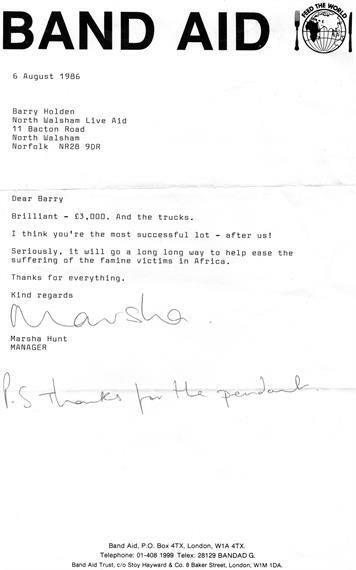 Following the event we received a letter from Bob Geldof saying that our gig was the most successful spin off event, by comparison with the Wembly Gig in the country. The NWLA group went on to organise the local participation in the "Run The World "appeal with hundreds of runners taking part. On 22nd January 2005 six bands performed, a huge raffle was held and a memorabilia auction all with the help of local businesses raised almost £6,000, which was spent helping the International Lions Club build a family centre for orphans in Thailand (see www.lionsclubs.org). 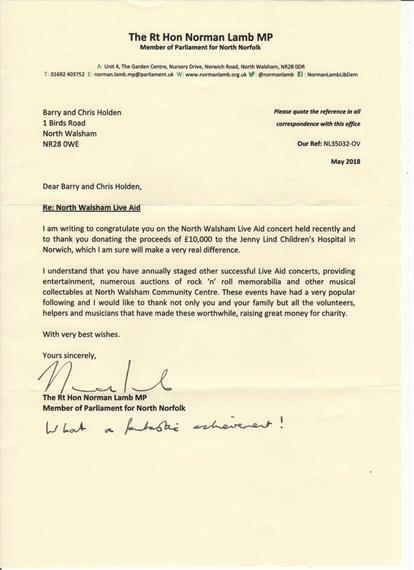 Sat 25th March 2006 saw the next event which raised around £3,000 for paediatric medical equipment for local surgeries for the benefit of local children. Sat 24th March 2007 another night of rock raised £3,500 for the new music therapy department of Quiddenham Children's Hospice. Sat 29th March 2008 raised £3,877.00 fpr the Hamlet childrens trust in Norwich. Sat 28th March 2009 was the date of the gig, in aid of CHILDREN with LEUKAEMIA, same venue an basic details 5 bands, memorabilia auction and raffle, special feature is that Barry was lucky enough to meet Eric Clapton, Roger Taylor, Mike Rutherford, Gary Brooker, and Jeremy Clarkson and obtained several signed items for the auction see PICS. Barry also had signed items from Bill Wyman, Thunder, Slayer, Chelsea FC, Liverpool FC. and donated items signed by Elton, George Michael, Velvet Revolver, O.C.C. a very rare sinature of GENE VINCENT and a guitar signed by Green Day WHAT a night it was ULTRA EGO, PINTO, RAW EDGE, CIRCUS AND BEYOND DUPLICATION rocked the venue and combined with the auction North Walsham Live Aid raised £6,000.00 enough to send 5 families to Tuscany for a post treatment break and also sponsor dozens of children for the huge kids party later in the year. Sat 27th March 2010 was in aid of the TEENAGE CANCER TRUST Featuring THE DIVIDE--TO THE LAST--RAW EDGE--POCKET GODZILLAS and SHY FLY. PA was supplied by Rhythmic Sound and Light, Raising £3500.00. Sat 14th April 2012 was in aid of McMillan support for paediatric nurses in Norfolk .RAW EDGE---BLIND TIGER---BURNING CROWS---POUT AT THE DEVIL AND THE FLOATING GREYHOUNDS Played for one of our most successful gigs to date, raising £5,000 for the charity, once again with RHYTHMIC SOUND AND LIGHT. The concerts are always for the benefit of children. As with the first event a major part of the income is from the memorabilia auction which is supprted by stars such as Mike Rutherford, Roger Taylor, Eric Clapton, Nick mason, Bill Wyman ,Phil Collins and many more, (see supporters page ) , as well as organisations that have access to memorabilia. The only expences on the night are for the venue,and licenced security, all bands and helpers give their time free. Sat 6th April 2013. The charity for this year was "Nelson's Journey" Supported by KAMIKAZE RADIO--FLOATING GREYHOUNDS--RAW EDGE--NO MERCY AND BLINDSIDE,With CRUEL FOLK Playing om our new acoustic stage during band changeover. The total raised for the charity was £4,750. Thanks also goes to Alistair Zelley for the credit card system.--------------------------------------------------------------------------------------------- SAT 19TH APRIL 2014 Our best night yet fantastic support from North Walsham ,super response to the bands ,Grease Monkeys, Cruel Folk, Raw Edge, Burning Crows, Pure Passion, and Pout at the Devil. Some really great lots in the auction and mega raffle gave us the ability to donate £10,000 to the Sporting Light Appeal, our designated local children's charity for 2014.------------------------------------------------------------------------------------ FRIDAY AND SATURDAY 17/18th APRIL 2015 , FRIDAY and SATURDAY 15th and 16th of April 2016 FRIDAY 21st and SATURDAY 22nd April 2017 A full report on these gigs with photos and all previous events and can be seen under PAST LIVE AIDS. Barry would welcome any items donated for the concerts by celebs or private individuals that own memorabilia or details of any band that would like to perform at one of the gigs. 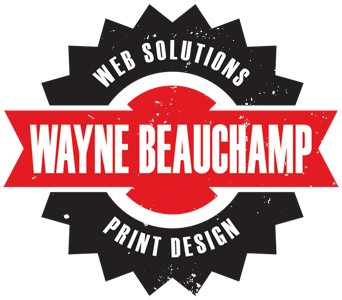 The Live Aid Logo is used without permission but with the greatest respect.